Purple Swamphen 紫水鸡 was discovered at this site in the late 1990s. 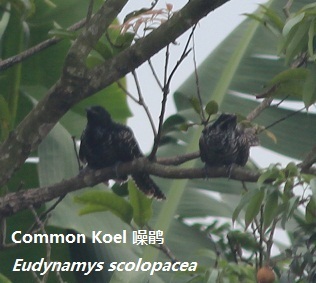 This is the only reliable site for this species in Guangdong. Black-crowned Night Heron, Watercock, Painted Snipe, White-shouldered Starling. Search the edges of the paddies and fishponds for bitterns, crakes and rails. Take a taxi from either Haifeng or Shanwei to Shagang and then head further on the road to Da Hu 大湖. The long straight road heading south-east from Shagang runs through extensive paddies on each side of the road. A good alternative location for the Purple Swamphen is to continue to the end of the straight road, through a small village and then over quite a large bridge (with a dam?). Turn right immediately at the end of the bridge. There is a small car park here for the extensive egretry behind. Walk up behind the house here and up on to a lane heading away from the road. Follow this for 5 minutes until the lane rises slightly as it skirts the hill. Look out across the fishponds and the reedy edges are good for the swamphen.